While most people don't collect a variety of fishing lures for catfish, they do collect old coins. Coin collectors may choose to add specific coins to their collections because of their value or historic significance. Ø 29 mm / 0.114". Here is the coin, presented in a First Day envelope (FDC) to celebrate the 2000th anniversary of Bonn. Occlusion: 26 mars 1990: The coin in an envelope with the stamp dated March 20th 1970 - Scott 1014. Occlusion: Berlin, March 25th 1995: The coin in an envelope and the stamp are dedicated to art, literature and music. 2 - Coin worth 10 Pfenning featuring "Stadt Bonn" (town of Bonn), dated 1920. (Ø 21 mm / 0.082"). 3 - Coin worth 10 Mark, dated 1970, from the Deutsche Demokratische Republik. Ø 35 mm / 0.137". 6 - A German medal, signed by Th. Gruner. The heads side depicts Beethoven almost smiling, and the tails side shows a beautiful engraving of the house where Beethoven was born, in Bonn. 7 - A german medal from 1926, struck by K. Goetz and depicting Goethe et Beethoven. 11 - Gold medal dated 1980. On the other side, these words are engraved: 'Licht senden in die Tiefe des Menschlichen Herzens - Des Künstlers Beruf' (Light from the Artist goes into the deep Heart of Mandkind). 11b - Silver medal dated 1980, like number 11 but bigger. 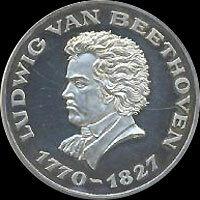 12 - Silver medal dated 1977, realised for the 150th anniversary of Beethoven's death. It was created by the Beethoven Haus in Bonn. 13 - Small coin from the collection "Große Musiker" (see also the silver medal number 21). 14 - German medal from a series 'Die Großen Deutschen'. 17 - Silver medal, dated 1989 created for the 100th anniversary of the Verein Beethoven Haus. The portrait is probably from J. B. Schreiner, and made in 1909. 18 - Silver medal. The reverse side says: 'Music is a higher revelation than all wisdom or philisophie - Beethoven'. See also medal number 34. 19 - German medal with the portrait of Beethoven made in 1786 by Joseph von Neesen. The reverse side is about the nomination of the young Ludwig as organist in 1787. 20 - Medal with the portrait of Beethoven. On the reverse side, there are the signature of the composer, his name and the dates of his birth and death. It was created in 1977, for the 150 anniversary of Beethoven's death, under the patronage of the Beethoven-Haus Bonn. 21 - German Medal in silver. Portrait of Beethoven with texts both in German and in English: 'Great Musicians - Germany'. 22 - Modern portrait of Beethoven. On the reverse side, the words 'Berühmte Deutsche' (Famous Germans) and a greek temple, a pantheon. 23 - Superb silver medal dated 1977. The 150th anniversary of Beethoven's death is celebrated on one side, with his portrait. On the other side, the hands of the composer and the words: 'Hands of the greater composers of classical music'. 24 - Klein's mask, realized in 1812 is the portrait of this medal. 25 - Portrait of Beethoven, signed Dominik. The medal is dated 1977. The reverse side shows the Musikzimmer of Ludwig van Beethoven. This medal comes at least in three different sizes. 27 - Portrait of Beethoven. The reverse side is the manuscript of one of Beethoven's work. 27' - The same medal, but in gold and much smaller. 28 - Old medal with the portrait of Beethoven on one side, and the inscription "Dem Schöpfer des Schönen in Tonen" ("To the creator of the greatest music") on the other side. 29 - German medal with a portrait of Beethoven and the inscription "Meister Unsterblicher Musik" ("Master of Immortal Music") on one side. The other side represents Heiligenstadt, small village close to Wien where Beethoven often went for hollidays. 30 - Portrait of Beethoven on the head side. The text that circles the music instrument on the tail side means: "The creative genius of the German spirit". 31 - Portrait of Beethoven of the head side. On the tail side, it says: "To the 100 death day of the immortal". So this medal was probably created in 1927. 32 - Old medal by Wurbel. 34 - Gold medal realized on the 26 of march 1977 for the 150th anniversary of Beethoven's death. The reverse side says: 'Music is a higher revelation than all wisdom or philisophie - Beethoven'. See also medal number 18. 35 - Gold medal realized for the 200th anniversary of Beethoven's birth, in 1970. 36 - Gold medal with Beethoven portrait and the '€uro' symbol. On the reserve side, the year 2000 celebrates Europe in several languages. 39 - The front side shows Beethoven's portrait and the Beethovenhaus and Beethoven's violin is on the reverse side.